My wife and I were hopelessly searching the video store one night when we decided to take a chance on a movie neither of us had heard about before. 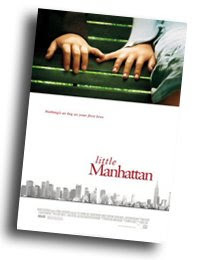 It was called Little Manhattan, and it is hilarious. Most guys steer clear of romantic comedies and all of their predictable plot lines, much to the disappointment of our female counter parts, so I thought I'd give you all a heads up on a romantic comedy that you both will enjoy — guaranteed. * Every single couple we've recommended this movie to has loved it, even though almost every single time, the man has been pretty hestitant to believe me. The story's about an eleven-year old boy's first love. The gold in this movie is that it is narrated by the thoughts of this boy as he is dealing with the change of going from hating girls to liking them, and they nail every thought every guy has ever had during these formative years. The women like it because it's cute, and the men like it because they can relate. So, surprise your wife with a romantic comedy this week. She'll appreciate the thoughtfulness, and you will both enjoy the movie. *Okay, so I really can't guarantee it, but I thought it just made the point sound stronger. I just watched this last night after you recommended it and I just wanna say thank you! My girlfriend and I absolutely loved it, it was cute and fun. Wouldn't be disappointed if you reviewed a few more movies.